This Gap ad is getting a huge response on social media. Gap’s efforts to create clothing for every occasion — be it color-blocked basics for the workweek or flashier pieces for a night out on the town — have now extended into a brand-new territory, and it’s causing a lot of online chatter. The clothing brand recently shared a pair of photos to promote their soft-wash cotton T-shirts on Instagram. In the first photo, a mother cuddles a child close to her chest while wearing a navy-colored sleep shirt. In the second photo, which requires Instagram users to click through, the mother is breastfeeding her son, who peers out calmly at the camera. Instagram commenters had a lot to say about the photos, particularly the second image, continuing ongoing public discourse about breastfeeding in public. The ad meant a lot to Adaora Akubilo, too, as the model featured in the campaign. The moment happened organically when she needed to nurse her son on set, she told TODAY. “It’s definitely something that I don’t mind giving a voice to because I understand the struggles of women who nurse, especially toddlers," she said, referring to her 20-month-old son, Arinze. "And (I'm) very thankful because a lot of women are feeling empowered and inspired by that moment of me nursing my son. That certainly wasn’t my intention. I was just being myself. My son was just being himself. And I just happened to be in a room full of people and a photographer who supported me and didn’t judge me and was like, ‘Go ahead.’"
Akubilo, who hails from Connecticut, added that she can't wait to tell this story to Arinze when he's older. "I think it’s going to be a great thing to tell him when he’s older about being himself," she said. "‘You were just being yourself by nursing. And by getting the nutrients from your momma that you needed, and look at that: the world accepted you for that. Just be yourself.’ That’s the biggest point I can definitely share with my son about that moment. Just be yourself, and it’s all good." Until then, however, Akubilo will just have to settle for knowing that her son is Instagram famous — before he even knows what Instagram is. “At Gap, we are always looking for new ways to help our customers find the pieces they love to wear, day and night; inside and outside,” a spokesperson for Gap shared in a statement to TODAY. 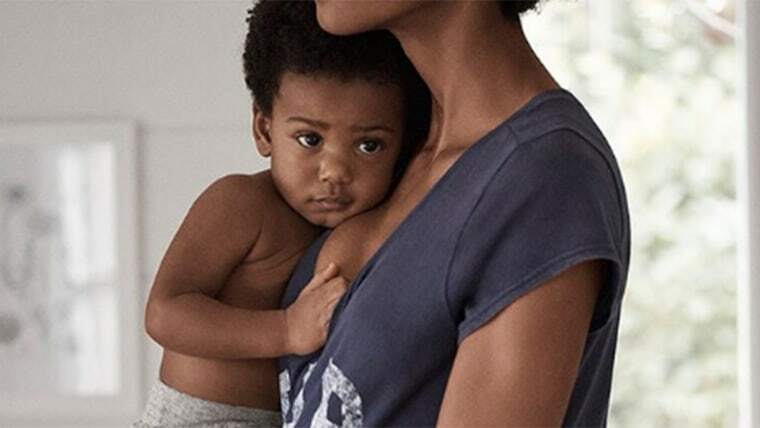 Many social media users have used the hashtag #NormalizeBreastfeeding in conjunction with the ad’s release, pointing out the significance of a major brand championing the practice. What do you think of the images?